Does making a Bart Simpson/Butterfinger joke make me old? No, of course not, don’t be silly. But the fact that the Simpsons as we know them debuted on my seventh birthday in 1989 makes me feel old. And awesome at the same time. I never liked Butterfingers as a kid, cowabunga-cred notwithstanding. Even now, I don’t eat them. I much prefer my candy bars to either be all chocolate and nuts or contain vast amounts of caramel. Josh, though, Josh loves Butterfingers. Josh likes any combination of peanut butter and chocolate but Butterfingers are his go-to candy bar when we’re on the road and we’ve stopped in to a gas station for a pick-me-up. 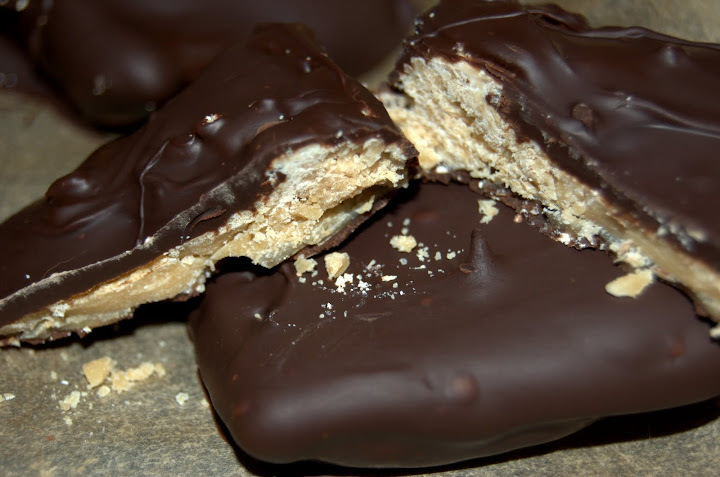 So when I started experimenting in making homemade versions of popular candy bars last year, this was his request, and it was seconded by my friend Tim. I sort of slowed down the candy-train a bit over the last few months due to just being busy with other things but now, spring is in the air, Valentine’s Day has come and gone, Easter is around the corner…the allure of melted chocolate is once again knocking on the proverbial door. So I went a-searchin’ for a recipe and I found this one from About.com that seemed pretty simple. I made them on Sunday as Josh’s sort-of V-day gift and actually, though I’m not a Butterfinger expert by any means, I thought they turned out pretty well as did Josh, and from what I hear, when he brought the rest to work on Monday to share, they received excellent reviews. Several people have asked me how hard they were to make. 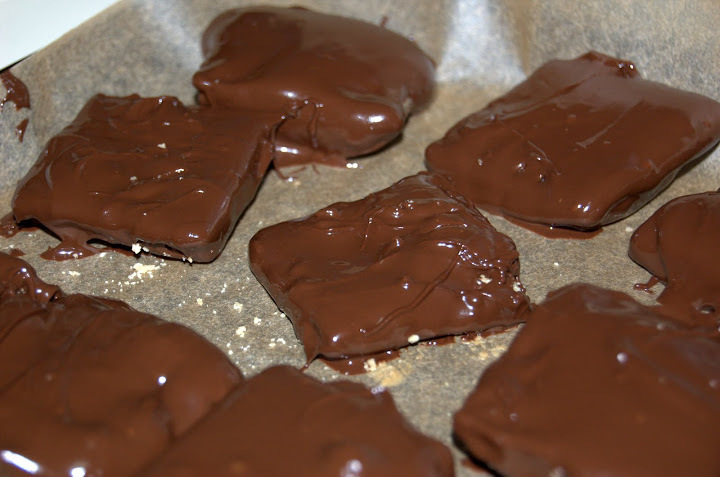 In terms of homemade candy bars, I’d say that they were less work-intensive than Snickers bars but more work than Heath bars, although the process was relatively similar. It’s the filling that mystifies everyone. In this case, you cook water and sugar down until boiling, add in light corn syrup and cook until it’s reached 300 degrees, which is a really high temperature and therefore the odds of burning yourself with molten sugar are rather high. 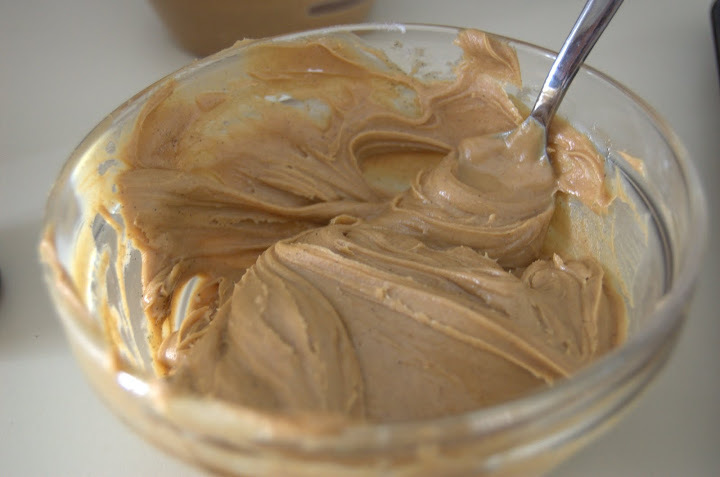 Then you mix in peanut butter, vanilla and a few other things, and spread it out into a pan to solidify. 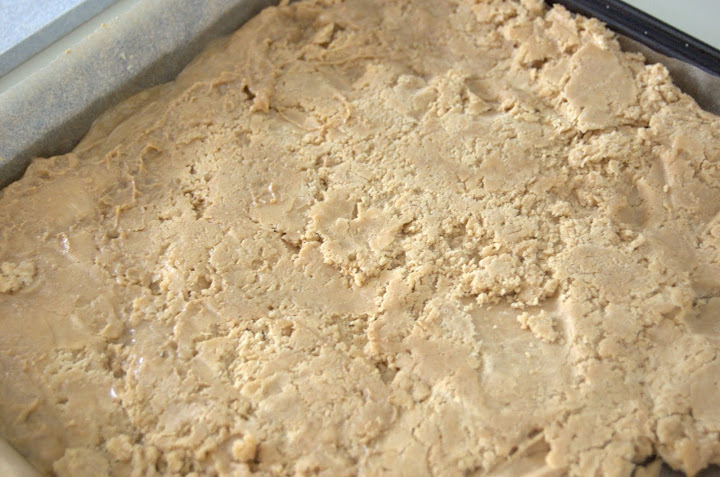 Which, by the way, it will start to do almost immediately, making it kind of difficult to spread or thin out, although it won’t get the hard, brittle Butterfinger texture until it’s rested for a couple of hours. Then you just dip in chocolate. 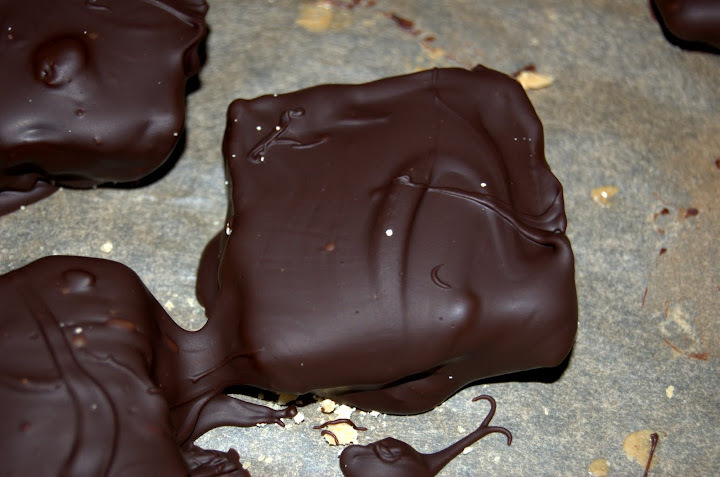 Speaking of chocolate, the recipe notes that you should use “chocolate coating.” I did not. I never do. Chocolate coating is made from vegetable oils instead of cocoa butter, so it’s easier for dipping and molding and doesn’t melt when your fingers touch it because it has a higher temperature tolerance. However, it doesn’t taste as good as regular chocolate. If you want clean fingers, use the coating. I prefer a better tasting bar, so I used high quality semisweet chocolate chips instead–and people notice; they rave about the chocolate I use. Occasionally it’s mentioned that the bars melt a bit on your finger tips but I’d rather lick my fingers clean and enjoy the taste than use a less than awesome chocolate or worse, put wax in my chocolate to make it more stable. But that’s because I’m a chocolate nazi. You shouldn’t feel at all obliged to be the same. Please, please, please tell me you (or Josh) saved me some. We did but then the dog ate it. Lies! Josh actually saved me some of the candy part and I’ve gotta say it was awesome. You could just make that and skip the chocolate and I’d be happy. “skip the chocolate”…please don’t strike me down for that blasphemy.